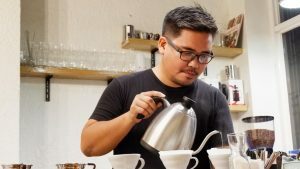 Pour over coffee has been embraced by the specialty coffee scene in recent years and there is much discussion about the best techniques and tools to use. But the filter method isn’t just for competitions and specialty coffee shops. At heart, it’s a straightforward way to make a delicious cup of coffee. Whether you’re a new home brewer or a seasoned barista, drip coffee can work for you. Take a look at this comprehensive guide to brewing pour over coffee. You may also like Should You Grind Finer For Better French Press Coffee? 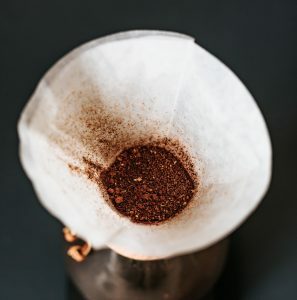 The pour over method involves pouring hot water through coffee grounds in a filter. The water drains through the coffee and filter into a carafe or mug. Pour over is also known as filter coffee or drip coffee, although these terms also include batch brewers. What sets pour over apart is that it is made by hand-pouring the water over the coffee. So you may hear it called hand brewing or manual brewing. 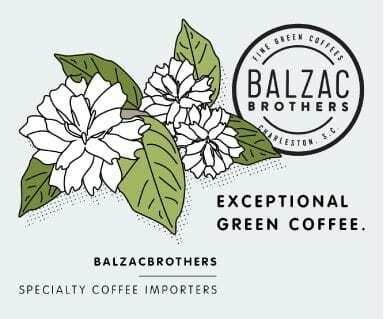 The technique has been commonly used in Europe since the 1900s and elsewhere for much longer, but was “rediscovered” by the specialty coffee movement in recent years. 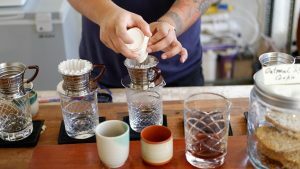 Why Use The Pour Over Method? 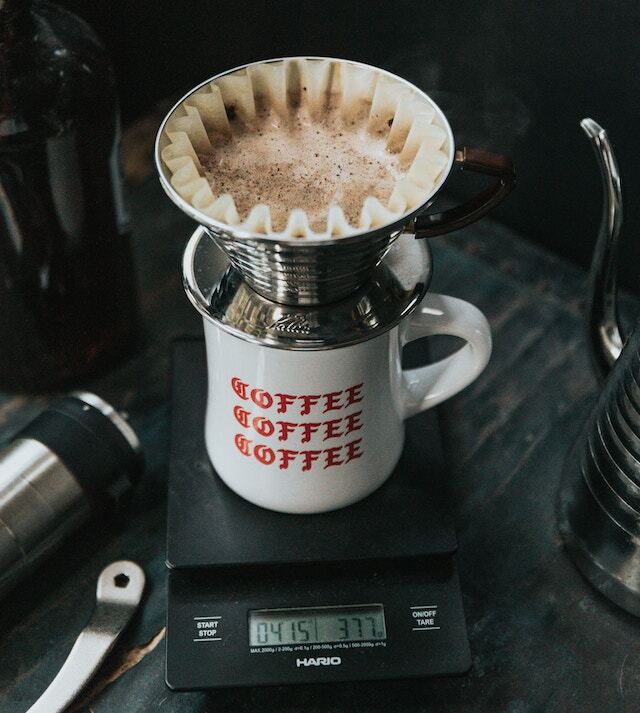 Pour over accentuates intricate flavors when compared to other brewing methods. This makes it a popular choice for single origin coffees, since it allows the flavors and aromas to shine. Good filter coffee is clean, clear, and consistent. 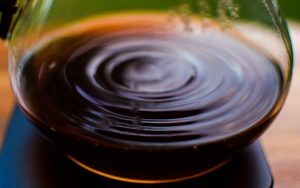 This is because the water is allowed to extract coffee oils and fragrances in its own consistent time and at its own pressure. The filter then catches a lot of oils, leading to a clean cup. And because this is an infusion method, it is a little more efficient at extracting coffee solubles than immersion techniques such as the French press. Immersion methods cause the water to become saturated, whereas pour overs use a constant supply of fresh water. But pour over coffee has some challenges. Manual methods are victim to human error and bad pouring techniques. For example, all infusion methods (including espresso) run the risk of channeling, where a stream of water finds an easy route around the ground coffee. This happens when there are clumps of coffee or the grounds are unevenly distributed, and it means that some of the coffee doesn’t get extracted. So it’s important that baristas learns how to pour in a way that evenly immerses the grounds in water. 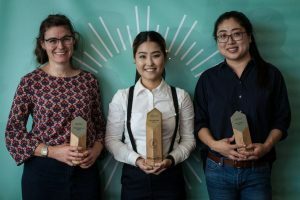 Because it is difficult to replicate a method precisely every time, some café owners and brewers prefer to use SCA-approved batch brewers instead. These machines bring automation to the method and can have more consistent results than a hand pour. 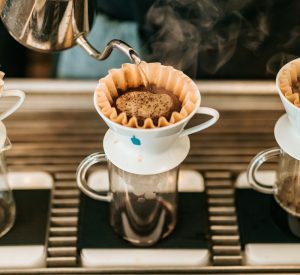 It may seem like there is an unending amount of options for pour over equipment, but you don’t need to invest in all of it. You can start with a simple device and some filters and then add more equipment as you choose. Let’s take a look at what the basic equipment you need to make a pour over. A brewing device or dripper is simply the piece of equipment that holds the coffee filter and grounds. The V60, Kalita Wave, and Melitta are popular choices. All three sit on top of the cup or carafe and they may seem interchangeable. But there are specific design features to each that aid flow and affect extraction. The Chemex is another popular option with its own design features that impact the cup. The advantage of using any one of these devices is that they are widely available, simple to use, and have filters made specifically for their design. There are also many online guides and hacks to using these devices so it’s easy to learn how to use them properly and adapt as needed. 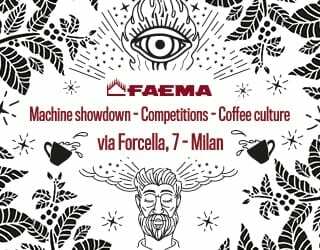 If you’re not sure where to start, try brews made in different devices in your local specialty coffee shop and ask the barista which they prefer and why. Paper or cloth? Bleached or unbleached? You may think that the filter is the least controversial part of brewing, but there is even some debate here. Specific filters are designed to fit different devices and allow efficient extraction. 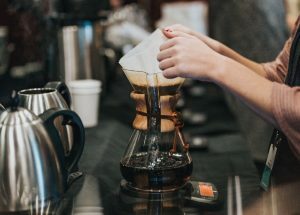 The Chemex uses paper filters that are 20–30% heavier than other filters, which the manufacturers say retain more of the suspended oils during the brewing process. Some claim that paper filters create an undesirable papery taste, particularly if they are bleached. To avoid this, rinse your filter before using it. Cloth filters have been around for a long time and some people prefer them because they don’t affect flavor and have a smaller environmental impact than paper. It’s up to you which specific filters you choose, but make sure they fit your device properly. Bunched-up paper or cloth will impede water flow and trap coffee grounds, which will make your extraction less consistent. You may not think scales are essential, but if you want to create consistently good coffee, they are. Invest in a digital scale and use it to measure your coffee and water. Knowing exactly how much of each you used in a good (or bad) brew can allow you to replicate the recipe or tweak it for even better results. Have you seen specialty baristas pour water from a small copper kettle and wondered why? Can’t you just use a standard electric kettle? Yes, you can. But you may choose not to. Like many things in specialty coffee, the important factor here is consistency. Kettles made specifically for pour over are designed to keep water at a stable temperature. This helps you create consistent extraction. And that long, thin gooseneck is designed to control the flow of water. Water tends to gush out of kettles with shorter spouts. Whether you choose electric, stove-top, or a batch water heater is up to you but look into the reviews of specific kettles and keep a thermometer handy to keep an eye on the temperature. Which Coffee Should You Use? So you have your equipment ready, but now what? Which coffee should you use with a pour over? There are a few factors to consider when choosing your beans. Because the pour over method works well to highlight subtle flavor notes and aromas, you may want to choose a light roast. 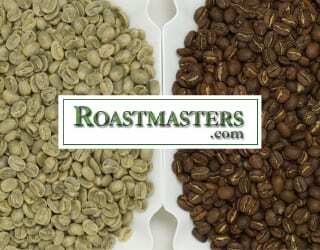 Beans that are roasted to this profile are the brightest, with the most acidic flavors. Of course, you can go medium or even dark if you prefer, but this brewing method is complementary to subtle flavors. Learn more in Light, Medium, & Dark Roasted Coffee: What’s The Difference? The size of your grounds affects the rate of extraction. 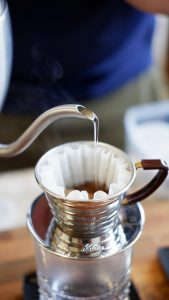 Pour over is a an infusion method, which means that the coffee and water are in contact for a shorter amount of time than in an immersion method, but longer than in an espresso. So you want the coffee to have enough surface area to extract before the water filters through into the cup, but not so much that they under-extract and produce a bitter brew. What this means is that you should start with a medium grind size and then evaluate your cup and tweak it as needed. If it’s a little watery or sour, try a finer grind. If it’s bitter and lacking sweet notes, try going a little coarser. And invest in a quality grinder to make sure your coffee particles are all ground to the same size. 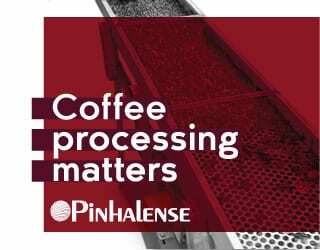 Lower-quality grinders may produce inconsistently ground coffee and a lot of “fines”. These tiny fragments of coffee extract very quickly and can throw your cup off. 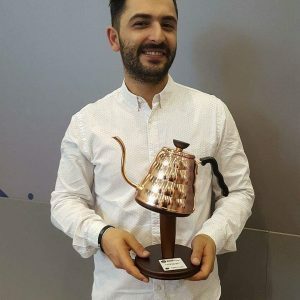 Stathis Koremtas is the 2018 Greece Greece National Brewer’s Cup Champion. He is also a barista at Taf and tells me how he prepares a V60 there. What Ratio of Coffee to Water Should You Use? You’ll see a lot of different suggested ratios out there, but 1:17 (1g of coffee to 17g of water) is a generally accepted good starting point. 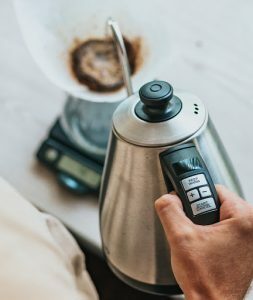 Make some brews with this measurement but adjust factors that affect extraction, such as grind size and water temperature, one at a time until you find a recipe that works for you. Then, try changing the ratio of coffee to water. If your brew tastes watery or weak, add more coffee without changing other factors and evaluate whether it tastes better. If you find your cup too intense, consider reducing the amount of coffee. But remember to keep track of what you’re changing so you can replicate your perfect brew when you find it. And don’t forget about the water. Tap water can contain minerals and contaminants that affect flavor, so use filtered water. Which Pouring Technique Is Best? 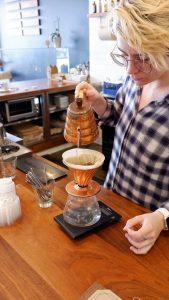 Avoid watching too many videos on technique when you first start to brew with the pour over method. It can quickly get overwhelming. Instead, start out simple. 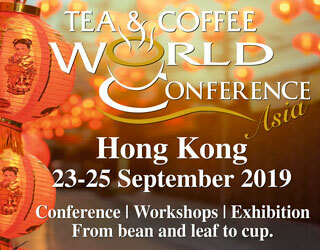 Be consistent in how your pour and learn how to use blooming, pulse pouring, and agitation to achieve even extraction. Many people pour in concentric circles, which helps the barista maintain a consistent flow of water. You can work your way up to more detailed methods or break all the rules when you’re more familiar with the basics. The bloom is the quick bubbling up of water that happens when you first pour. It is caused by the degassing of carbon dioxide that is built up in the roasting process. Light roasts and fresh coffee are likely to produce a big bloom because they usually contain more gases. Carbon dioxide can prevent even extraction because it repels water, and the disturbed grounds can sit at different heights. So let the gases escape and improve your chances of a consistent extraction. Gently pour twice the measure of coffee in water over the grounds. So, if you have a 15 g dose of coffee, pour 30 ml of water. Then wait 30 to 45 seconds until the bloom has ended and the grounds have settled. Pulse pouring means using multiple pours of specific amounts of water. You can experiment with the volume of water and number of pours. This technique help prevent channelling or grounds rising up the side of the filter. It also gently disrupts the grinds, causing them to move about and creating more even contact with the water. It’s an alternative to continuous pouring, which is when the barista pours the water at as constant of a flow rate as possible without stopping. Continuous pouring aims to keep the flow and saturation as even as possible, whereas pulse pouring is intentionally varied. You can use pouring technique as another variable to consider when adapting your recipe. Different types of pours will have different effects on extraction and therefore have different impacts on your brew. Learn more in Brew Guide: How Does Pulse Pouring Affect Extraction? This is simply mild disturbance of the coffee grounds during the brew process. There are many ways to agitate coffee, including stirring or swirling the brew. Agitation disperses grounds that can be left “high and dry” on the filter by channeling. It also breaks up any dry clumps inside the bed of coffee. By making sure all grounds are saturated, agitation aids even extraction. Take a look at What Is Agitation & How Does It Make My Filter Coffee Better? 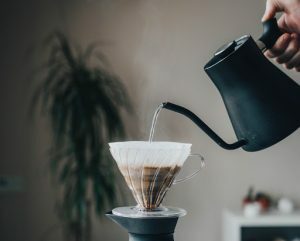 Pour over coffee can be a great way to make your daily cup and it doesn’t have to be complicated. By understanding these key topics, you’re well prepared to make a decent brew and have the tools to tweak it until it becomes a great one. Enjoyed this? 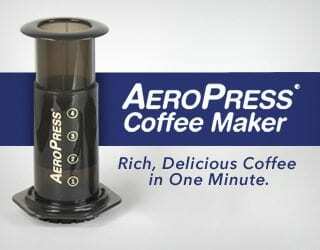 Check out Is Pre-Ground Coffee Ever Better Than Freshly Ground?